Another hot one today and then hopefully cooling off a bit. My image today is of a bird I was able to watch and photograph late last week. It was sitting in the branches of the Sycamore tree and would swoop down towards the grass. At one point it came back up with a worm which it ate. 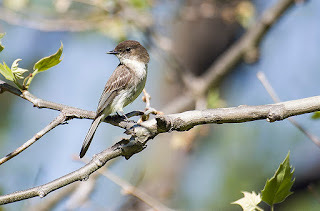 I am not sure of the type and also posted it to G+ with all the birders there, hopefully someone has an ID. It looked like a Flycatcher in my book but not sure if they eat worms as well. Anyway, it was very neat to watch and did not seem to mind at all that I was there taking photos of it.